What is it that’s so damn fine about a well-made breakfast burrito? The simplicity? The ‘tip of the cap’ to Mexican cuisine? Or, the fact you can ram the usual suspects of breakfast into your mouth in one thrust? Either way, breakfast burritos are a great way to start your day, regardless of whether you’ve just finished off your morning yoga or fallen out of bed with the taste of Tequila in your mouth. So, next time you feel eggs benedict and smashed avo just isn’t going cut it, we’ve eaten our way through the breakfast burritos on the Gold Coast so you know exactly where to head. Does this place need an introduction? 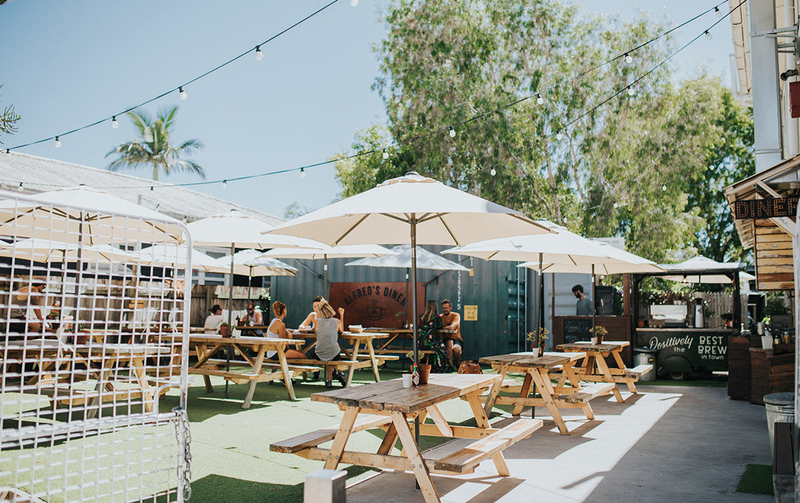 Regardless of churning out endless delicious burritos of several varieties, the boys at Alfred's Diner have got some of the finest coffee around and a vibin’ backyard spot in which to chill out in. Your options are the standard, but awesome, Alfred’s Burrito and then the Mexican Burrito—taking things up a notch with jalapeño and sweet chilli sauce. Arriba, Alfred’s! Nestled on a quiet backstreet in the laid back suburb of Tugun, we give you House of Hubert. If you haven’t been, we suggest you do. The breakfast offering is impressive even if you opt not to do a breakfast burrito, but we strongly suggest you do. The added addition of chorizo along with frying their eggs makes this one an easy addition to our list. One of the best burritos on the Gold Coast is a solid excuse to pull into Tugun next time you’re down that way, if we say so ourselves. Flying under the radar for most, but a solid little pinnacle of the Southport cafe scene, is The Roost @ 53. Now, these guys are kicking out some incredibly fresh and tasty daily specials; amalgamating American diner food with quintessential breakfast fare, and the result is, well, very good. They even change up their delicious breakfast burrito on the weekend, and also offer a veggie version for you herbivores. How does six-hour braised beef in your morning burrito sound? Definitely, a hearty way to start the day and a tasty one, we can assure you. This Nobby Beach cornerstone packs a punch in their (obvious) addition to our list of the best breakfast burritos on the Gold Coast, and never disappoints with their coffee, either. 52 Espresso’s offering is one for the fellas and those girls out there that (secretly) like to eat. The breakfast burrito at Mr. Bengel in Palm Beach takes its Mexican ancestry quite seriously. Garnished with coriander, lime wedge, and including sweet corn and a swirl of hot sauce on the plate for you to spice things up; this dish is very much true to itself. Is this gallant breakfast dish potentially changing the culinary landscape of the 4221? No, not by itself anyway, but it’s another reason in a now long list of reasons. This place ticks a lot of boxes when it comes to being a fave Gold Coast cafe, pretty much nailing everything they do. So, it’s not much surprise Burleigh Social are supplying the goods when it comes to an impressive breakfast burrito. Packed with fluffy scrambled eggs, lettuce, Bangalow bacon, Pico de Gallo and Kewpie mayo; coupling this with one of their exquisite iced coffees is going to diminish any hangover. Worked your way through the best breakfast burritos on the Gold Coast? You’ll want to dig into these delicious jaffles next.